Old School Communications. All the work and none of the fun. 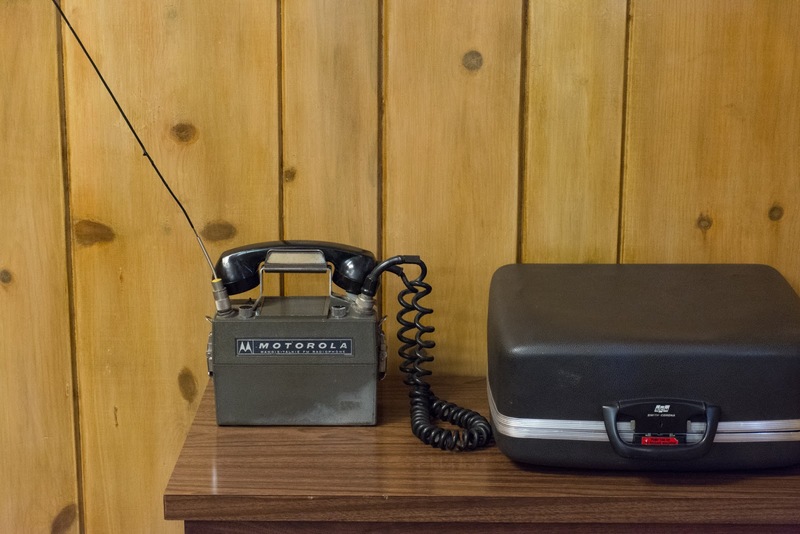 The radio telephone the secret service carried on the Johnson Ranch. Where's the screen for reading e-mail? I am now officially booked through the end of March. It's nice thing because it represents a bit of financial security but it does play havoc with the swim schedule. I will adjust. The thing that makes being booked up different for me this year is that so much of the current (and near future) work is video or a mix of photography and video. It seems obvious that corporations are profoundly changing the way they communicate with customers. You can see it in the new wave of websites. The ones from the tech community don't open with a banner photograph across the top of the front page anymore, they open with a video banner instead. The video banner is nearly always a lifestyle/brand presentation of the client. One company has a video of good looking professional people walking toward the camera in a light, airy and modern airport setting. They sell software that improves customer experiences and one of their big clients is the airline industry. The video is a quick, active encapsulation of what they promise: A quick and convenient airline experience; one made better by the company's phone centric software product. At least that's the premise and the promise. Even my theater client which we've supplied photographs to for 24 years has lately discovered the power of video content to move shows into profitability and engage their base in more active conversations around certain plays. While I'm making conventional images for the marketing of the new LBJ drama, All the Way, I recently spent three days making a combination of reportorial style still images, video interviews, video programming on locations and audio interviews. They're building a strong YouTube channel and also inserting video, wherever possible, in social media. As channels of content distribution get more splintered it seems that having more tools is always better. It's rare now, for me, to get jobs that don't have some sort of online video component (whether the client chooses to have me produce it or not...). Video is a self-contained way to present a complete story across any number of devices. From old school televisions to phones. I met this morning with a technology client who has commissioned me to do a new video for them for an upcoming trade show. Their booth will have a number of 50 inch monitors and the video needs to do three things: 1. Tell a shorthand version of the company's story. 2. Present an overview of their products and the benefits to customers. 3. Represent the company's partners. The video needs to come in under three minutes (harder to do than a longer program) and it needs to work well with, and without audio. To do the video we need some good still images of the products in prototype. We might also need a few more images that we can pan over of their existing products. We have good, existing video of the processes and the look of the headquarters. We'll need copywriting and some motion graphics and a big dose of editing.